You’re on a bus the size of a large minivan, which crams about 25 people inside. There’s a side door that opens out to the street, and a boy (usually no one over the age of 25) mans that door, and is constantly shouting out the window where the bus is going. He also slaps his hand against the side of the vehicle to signal to the bus driver when a passenger needs to get off. This guy is the bus-gatekeeper. He knows your personal destination. He remembers the exact change you may need 5 minutes later when he can’t give it to you at the moment. He chats with everyone on the bus. He is the face and livelihood of public transportation. He slaps the door, yells “stop!” to the bus driver, but this time no one gets off. He’s stopped to get Turkish coffee on the side of road and chat with the man who owns the shop while the coffee is being prepared. But no one says a thing, because that’s how it goes. Like billions of other people around the world, his day revolves around caffeine. He’s been working hard all day yelling out windows over honking horns and speeding taxis, and coffee is a way for him to revitalize that smile and charm. There is no huge rush to things; instead, the bus driver makes the best of it by watching a world cup match on his phone while we wait. The non-scheduled buses and endless consumption of coffee became a part of the daily routine of my life in Amman. It was adjusting to the big things, like learning to be late all the time, and to the small things, like learning where to buy the best bread, which made this place a temporary home, but establishing a daily, reliable routine in the beginning of the trip was a challenge. However, the beauty of the Foreign Intrigue Scholarship is that we get to create a temporary home. We have these challenges because none of us are tourists. As journalists, we have a job to seek out deeper stories, details, history, conflicts, etc. and to combine our understanding of the world with that of other individuals who fill our “every day,” as those are the people for whom we are reporting. The innate curiosity of journalism lends to the best kind of travel, because it allows you to make connections, find unearthed stories and perspectives, and see the world with even more complexity than you could imagine. More often than not, being a reporter allowed me to be welcomed into the lives and homes of many whom I had met just minutes, hours, or days before. This culture of welcoming and acceptance is true for most all new people arriving in Jordan, but as a journalist, I saw it on an even greater scale. I went to interview two sisters at their home about a job-training program they were a part of in Karak, a town south of Amman. 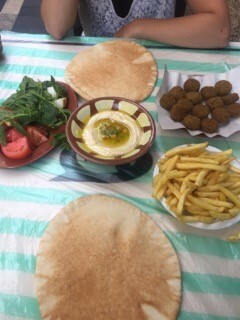 In general, when you enter someone’s home in Jordan, you are treated like a traveler who has just crossed the desert to get there; first coffee, then tea, then water, then juice, then cheese filled bread, then bread topped with cheese, then a plate full of five different kinds of fruit. And then, when you’re about to pass out from fullness, the women enter the living room with a box and say, “Cheesecake?” This same style of hospitality was also offered by the woman from the NGO who accompanied me to the home, taking me on a side trip to Karak castle, an ancient ground which boasts some of the greatest views I have yet to see in Jordan. This is a different kind of hospitality. There is something about being in a city that isn’t yours that is extremely humbling. 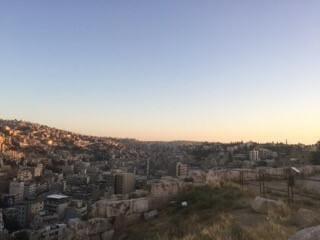 Having an internship in Jordan, and traveling in general, is like an ego-check in its purest form; not knocking my ideas down, but merely shifting them. It forced me to leave all things in my comfort zone behind, and approach the world more open-mindedly. It is in this newness that I found the greatest comfort, not in a home or an apartment, but in people. Because what made this trip, what I’ll never forget, what grew each time I woke up each day, was the gift of people letting you into their lives, into their community’s lifeblood, and into a way of life and a new perspective. It was in the taxis whose drivers rule the chaotic city streets, in playing soccer with the daughters of a Jordanian family I knew there, in the openness of homes, kitchens, dialogues and disagreements. At the end of the day, I was shown by many people on this trip that if you put your passion first, you’ll always have something, even when life may seem temporarily empty. If (and when) life goes haywire, you have that pen, microphone or paper, to speak to. It can forever be your accomplice and confidant and creative juice, fueling and challenging you to see a world more chaotically beautiful than you ever knew.